Occupation: Field agent for the Commission on Superhuman Activities. Powers/Abilities: Brian Rinehart possessed the mutant ability to channel energy from his hands for destructive blasts and to form a defensive shield. He also occasionally wore a battlesuit designed by the CSA which allowed him to fly, fire energy blasts, and featured a defensive force field. History: (Sentinel I#7)- After a giant robot attacked Antigo Senior High in Wisconsin, Rinehart was assigned to investigate, but was offered few resources for his job. He and his men began by investigating the blast marks left where the robot had activated its bootjets. (Sentinel I#8)- Rinehart was contacted by the local sheriff when a plane crashed nearby, and Rinehart offered the aid of himself and his men. He, Fields, and MacKenzie donned battlesuits to reach the crash site, only to find a Sentinel attempting to rescue the plane. Rinehart, guessing that it was behind the attack on the high school, led the attack. The Sentinel, controlled by student Juston Seyfert from a distance, responded to the threat posed by Rinehart and his men by abandoning the rescue effort in order to fight back. (Sentinel I#9)- Rinehart's men were defeated by the Sentinel, and he activated his mutant powers in an attempt to defeat it, but the Sentinel battered him unconscious. 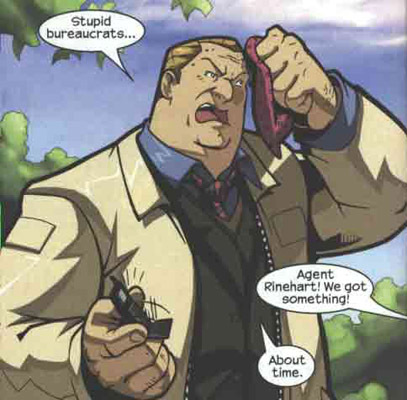 The Sentinel attempted to execute Rinehart, recognizing him as a mutant, but Juston was able to prevent it. Despite his defeat, Rinehart was able to convince the CSA to grant him more resources, since the Sentinel was government property. He had also begun to suspect that a teenager was controlling the robot. (Sentinel I#10)- Rinehart and his men conducted a search in the area around the plane crashsite, hoping to find clues to the Sentinel's whereabouts. When Juston came by, Rinehart was interested in the teenager's abilities as a mechanic. The next day, he confronted Juston at the hospital where his younger brother Chris was a patient. (Sentinel I#11)- Just as Rinehart began to speak with Juston, Chris' condition took a turn for the worse, and he had to be transferred to a hospital in Wausau. Rinehart offered to drive Juston, and during their conversation on the drive, brought up the Sentinel. 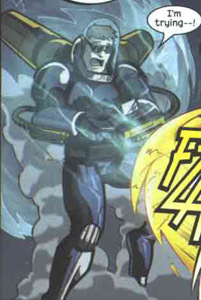 Rinehart correctly pieced together how Juston had used the Sentinel to attack his high school in order to make himself into a hero, but Juston refused to admit to anything. 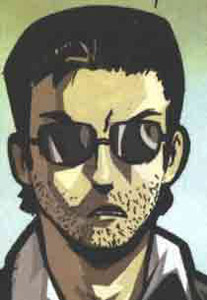 Rinehart suggested that Chris might be a mutant, and thus in danger from the Sentinel. When the Sentinel arrived, chasing them, Rinehart stopped the car, told Juston to hide, then activated his powers to face the robot in battle. 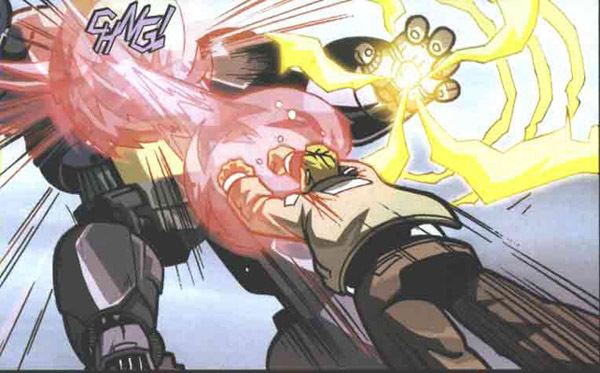 (Sentinel I#12)- Rinehart fought the Sentinel, but was only able to hold his own until Juston distracted it long enough for him to get in a blast which deactivated the robot, but it managed to fire one last energy blast at Rinehart which killed him. Comments: Created by Sean McKeever and UDON Studioes' Vriens, Heilig, Hepburn and Veddea. When Rinehart used his powers in Sentinel I#9, it appeared as though they were a function of his battlesuit-- a clever way to keep readers from guessing that he was a mutant. Fields was one of the CSA agents assigned to Brian Rinehart. He joined Rinehart and Mackenzie in donning armor to battle Juston Seyfert's Sentinel, but was easily defeated. MacKenzie was one of the CSA agents assigned to Brian Rinehart. He joined Rinehart and Fields in donning armor to battle Juston Seyfert's Sentinel, but was easily defeated. Walsh was one of the CSA agents assigned to Brian Rinehart. After Rinehart died battling Juston Seyfert's Sentinel, Walsh took charge of the operation. He suspected that someone else was controlling the Sentinel, but apparently did not suspect Juston, and simply asked Juston not to reveal that Rinehart was a mutant.